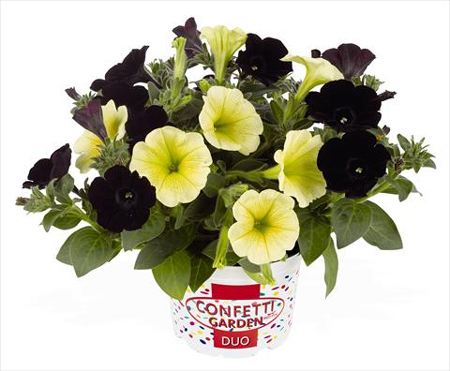 Our Confetti Garden™ ‘Surprise Bumblebee’ Combination is a designer mix guaranteed to be ‘ooohed’ and ‘aaaahed’ over; this Surprise series of petunias accurately named for what they bring to the mix. Surprise Midnight Cowboy has rich, burgundy red blossoms that will mature to almost black, while Surprise Yellow displays impossibly yellow throats surrounded by pastel margins. Yes, the resulting mixture looks like so many bumblebees, from a distance anyway. Our Surprise Bumblebee combination will tolerate full sun to light shade (>6 hrs. of sun) and has a mounding, trailing habit, growing 10 to 20-inches high and wide. The plants in our 'Surpise Bumblebee' plants are grown and shipped in fine quality growing medium and are guaranteed to arrive alive and ready to thrive.